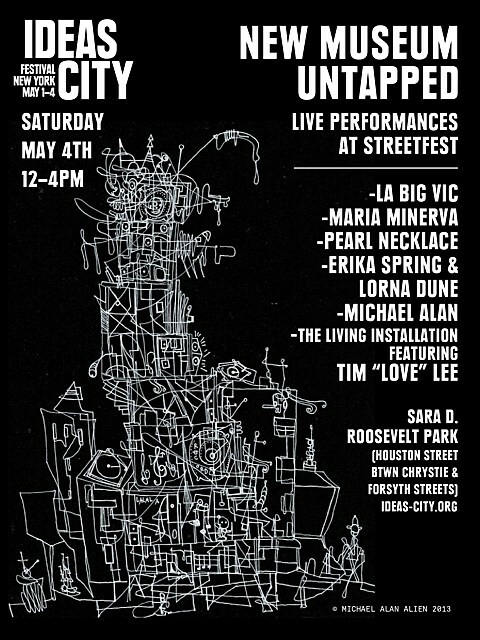 This Saturday (5/4), NYC’s New Museum is presenting “New Museum Untapped: Music in the Park,” a day of free music happening as part of the “IDEAS CITY StreetFest,” which goes down from 11 AM to 6 PM, occupying more than a square block around the New Museum. The musical performances will take place on the basketball courts in Sara D. Roosevelt Park from noon to 4 PM. Artists playing include La Big Vic, Maria Minerva (whose new Bless EP is out now), Pearl Necklace, Erika Spring (of Au Revoir Simone), Lorna Dune, and Michael Alan. Saturday night, Andrew WK will use his keyboard to control the lights on the outside of the New Museum.